Why must there be a constant celebratory parade of birthdays and barbecues and fun all summer long? Obviously I'm incapable of self-regulation because here I am, after another evening of injudicious imbibery, feeling a little... lackluster this morning. So, now I have this pathetic need for entertainment -- I want to be dazzled -- and Good God, I don't want to think very hard. Thinking hurts. Here, neato fun table! 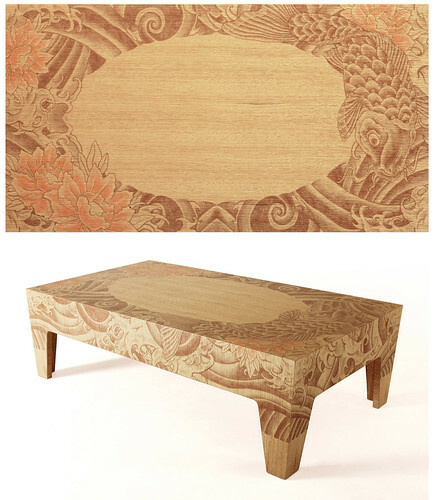 The tattooed Yakuza coffee table from Reddish, with its coyly unmarked "feet," definitely belongs in the home of an ink-stained scenester. I need more crazy patterned goodness... but I am never one to be impressed by the mundane. Thank you, Front Designs, for catering to my hazy whims. UV imprinted wallpaper, for commitment-phobes everywhere, shows its pattern only in sunlight. If only tattoos worked the same way! This reminds me of my husband's college apartment that revealed strange and intricate dayglo scribble-covered walls only when viewed under black lights, of which there were many. Needless to say we moved into my apartment, beautifully decorated (to my impoverished 18-year-old mind) with the obligatory iron-barred futon, giant tacky Chinese fans, and even gianter (but FREE) Beatles poster. I can still feel skeevy Ringo's eyes tracking my movements across the room. I'm so glad I don't live there anymore. Wallpaper again, this time with a pattern formed by mouse nibbles -- the roll was scanned and inverted so only the indentations showed the pattern. Ouch! Too much thinking, but how cute is that little guy? My cat would love to meet him. The pattern here was created by bugs that chewed tracks through the wood, leaving impressions (wink, wink! nudge, nudge!) of their ways and means. This one's kind of funny to me because I spent much of my time in Hawaii desperately fighting the bugs that did this very thing to my furniture, my photographic prints, and worst of all, my negatives. I'm about to scan those negs in right now and say I MEANT TO DO THAT. It's all about intent, right? 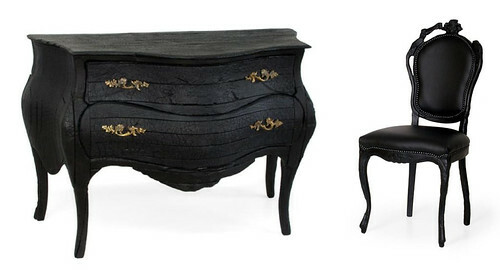 Charred furniture from Maarten Baas's Smoke series bears all the marks of its time in fiery flames. Apparently Baas burns the pieces and yanks them before they crumble to the ground, but not before little bits are broken off and cracks form in the wood. This appeals to the erstwhile gothy side of me, the side that still gets really excited when Bela Lugosi's Dead surfaces from the depths of my shuffled itunes (which are mostly rap, if you must know. I have a weakness for dirty booty jamz). 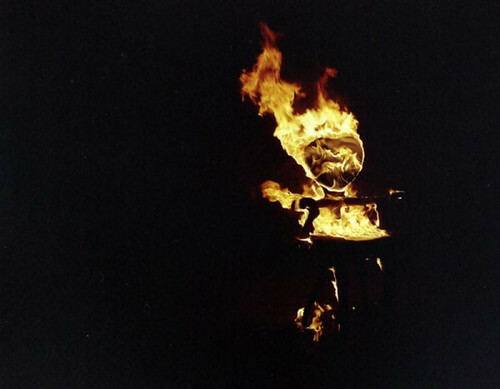 Fire always cheers me up.